As a fan of bob wigs ... 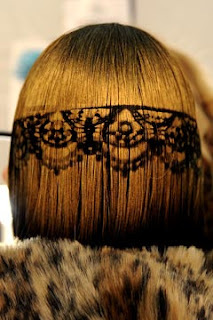 I love this spray-painted wigs idea from Betsey Johnson Fall 2011 runway hair by Peter Gray for Redken. GET THE LOOK HAIR: All products by Redken. Black acrylic wigs were flatironed for the sleekest texture before strands were snipped into a blunt bang and angled bob. Gold spray-paint was applied in gradation down the back of the bob to create a high-shine illusion. Gray then aligned sheer black lace fabric straight over the gold paint, spraying black paint over it to leave the ornamental imprint of lace. Hairspray No. 12 made for moveable hold that swayed, while Lacquer No. 18 and the yet-to-debut Shine Spray created a glasslike finish.